As we are all too well aware, roadwork delays in the Naas area are adding to traffic woes. This has become particularly acute as the busy season commences and adverse weather makes driving conditions more difficult for motorists. There are three major roadworks projects underway: the Sallins Rd. 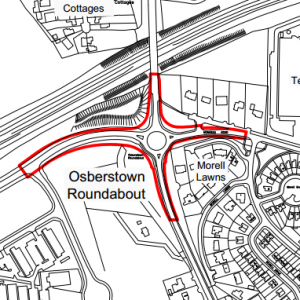 roundabout widening, Main St. bus stop upgrades, and Kilcullen Rd. roadworks. All of these together are contributing adversely to the movement of traffic around Naas town and Sallins village. While it is welcome to see these projects being carried out, I would have hoped that they would have been carried out in a timely and efficient manner. Instead, we’ve had to put up with the opposite. Therefore I’ve stressed with stakeholders involved the URGENT need for prompt completion of the roadworks to relieve this traffic chaos, especially now in the run up to Christmas. The Sallins Rd. roundabout and Kilcullen Rd. upgrade in particular are simply taking far too long to complete. It is unacceptable. One would have thought that in this day we could deliver projects like these quickly and efficiently, but it’s worse they’re getting. While it is imperative we carry out these roadworks, it is equally important that they are done in a timely fashion with minimum disruption to traffic around the town. These roadworks are taking months. Many residents have raised the issue with me about the ongoing roadworks on the Sallins Rd. and how it’s causing havoc daily. I will be doing all I can at council level to expedite the completion of these works, especially now that bad weather and the busy Christmas season is upon us. It is critical that Naas town gets its Main Street back to normal for Christmas. As mentioned yesterday the council told me on phone that the roundabout works were always planned to take up to 31 Dec. Did they advise you and the councillors differently? They shouldn’t though speed up at the expense of delivering poor quality which seems to have happened with the Sallins school road resurfacing ? Yes Paul and I said at the time as I am saying now, I think that is way too long. They stressed at the time if they made good progress they could bring it in quicker as they did with the Sallins-Naas bridge closure last year but that hasn’t happened. Meanwhile the Kilcullen road works are dragging on for almost a year and Naas town centre has parking spaces all over the place for the “bus hub” as we approach Christmas with temporary parking at the worst time of year. I thought it was a bad idea at the time and said so in council. These works should not be taking anywhere near as long as they are. Is it a resources issue within the council team? Did they have people re-assigned to the Carragh bridge, or are they all contractors? Now the Carragh bridge has re-opened it does not seem to have lessened the traffic volumes through Sallins. The temporary pedestrian lights just after the bridge do seem to be red for a very long time, a small thing for them to look at.